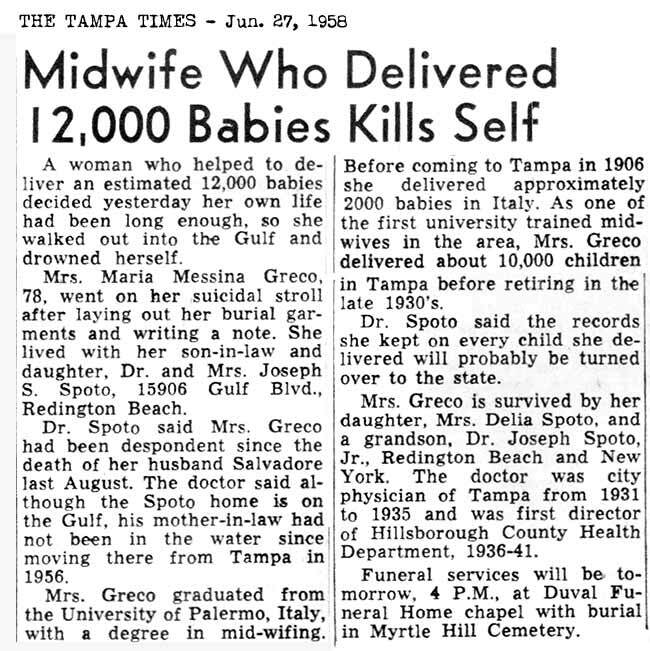 The midwife records of Maria Messina Greco are comprised of about 62 palm-sized notepads. Most of the early years take up one or two books, then later three to four books. The years from 1935 to 1939 are contained in one book. The post-it notes were added by the LDS church when they microfilmed the records. The original labeling can be seen above the post-it note. All the entries are written in Italian by Maria Messina Greco, none of the entries record the year of birth of the child, only the day, month and time. The year must be determined from the cover or the first page of the book. The large ring binder seen at the top, was not microfilmed. It is apparent that at some point in time, somebody sought to translate the records to English and typed them out, putting the pages in this binder. This binder contains easily read records from 1908 through 1912. 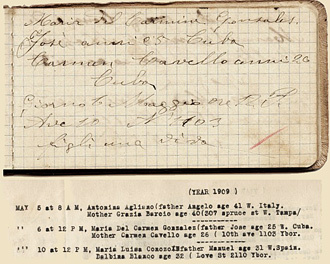 The births listed in this binder for the first half of 1908 are not found in any of the palm sized notepads. The oldest notepad starts in mid-1908. It is my conclusion that there was a notepad containing births for the first half of 1908, but was lost and/or not sent to LDS for microfilming. The pages in the binder are very fragile and thin, typed on both sides. Those for 1912 being at the back of the book, crumbling at the edges. Many years ago these records were sent to the Latter Day Saints church library in Salt Lake City and were put on microfilm. These microfilms are available for viewing in the LDS Family History Center on Lutz Lake Fern Road near Gunn Highway in Lutz. Hours: T 10am-2pm; W 9am-1pm; Th 1pm-9pm; Sat 9am-1pm. Closed: Fri., Sun., Mon. and major holidays. The cover of the 1909 notepad. A scan of a page from 1909. This is not typical quality, it's one of the rare pages written in ink. Most are written in pencil and are extremely light. A close up scan of the top half of the first page of the typewritten translation, 1908. Then a notation as to how many children the mother had and how many were still living. Some records also show Maria's fee and the social benefits society to which the family belonged. In the early records, 1908 and some 1909, every entry has been "X" out. I suspect it meant the fee was paid. Then in later books such as this one, the red slash probably indicates this. Later, each entry has the actual fee written in red. Most were $15 to $20. (The lower rates were often accompanied by a notation such as "C. Cubano" (Circulo Cubano), "B. Publico" (Beneficia Publico?) probably indicating membership in these medical benefit programs. 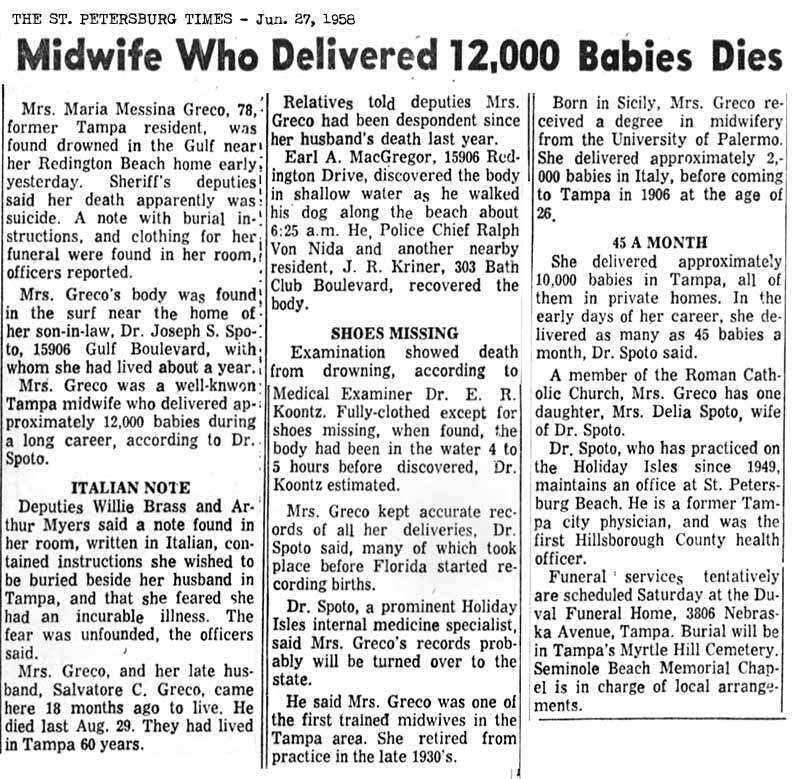 There was hardly a day that Maria did not deliver a baby. Many days she delivered up to 4 children. One particular day I found she had delivered children at 4am, 11am and then twins at 9 and 9:15pm. 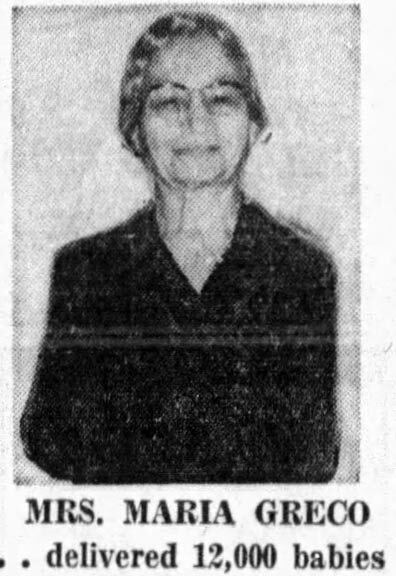 In my conversation with Adele Greco, she told me that her husband, Salvatore Greco (1st cousin of the Salvatore Greco who was married to Maria Messina) always spoke of Maria as a remarkable woman. Meet Salvatore Greco (1st cousin of Maria Messina Greco's husband Salvatore) and his wife Adele, gracious donors of the original books. 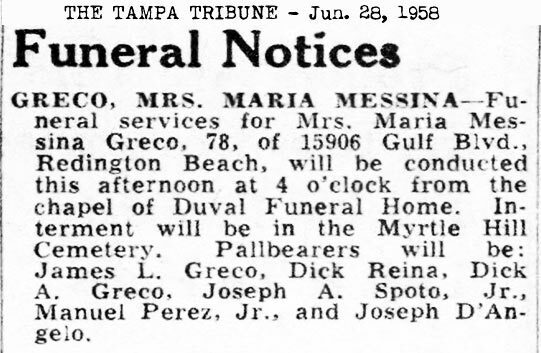 If you believe your Hispanic or Italian ancestor may have been born at home, in Ybor City or West Tampa during this time period, there is a good chance were delivered by Maria Messina Greco. 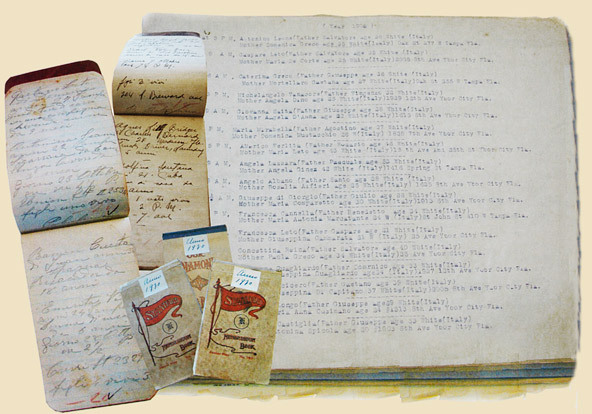 It took a dedicated team of four persons nearly two years to transcribe the records and put them in spreadsheet format. Sharing their knowledge of the Sicilian language along with talent in deciphering the handwriting, the monumental task was organized by Vienna Fuente and accomplished by Angelo Lorenzo, Vincent Collura, Jeannette Tamborello and Rosemarie Chambers--persons who all share a passion for Tampa history and its heritage. I no longer have the books. 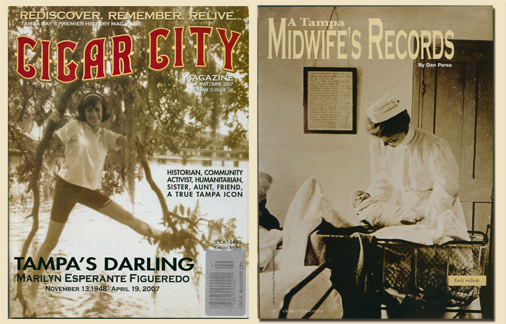 The second part of the agreement I had with Marilyn Figueredo when I initially turned them over to Cigar City Magazine has finally been honored. The first was that the information in the books would be freely shared for public access. Thanks to the dedicated work of the translating team, that has been fulfilled for some years now. The second part of our agreement was that the books would be donated to a museum or USF for preservation and safekeeping. The entire collection is now at the USF Special Collections Department for safekeeping and viewing. You can see them there. Read about it at the USF Special Collections website. See their PDF that tells about them. Read about how I discovered the actual books which resulted in Adele Greco offering them to me. The website with the Excel file for download which was originally set up by Vienna Fuente has apparently been taken down. You can now find them available below. I have stored these files in DropBox, follow these links and choose "Download" option. NOTICE: If DropBox prompts you to join, just close that window. You do NOT need to be a member to see or download these files. Choose the download option at upper right. If these don't work for you, contact me by POSTING a request on TampaPix on Facebook. After I respond, you can message me from there with your email address if you don't wish to include it in your post.